Nothing beats the smell of grilling outdoors on warm, sunny days, and we have a lot of both in Los Angeles. Between carne asadas, BBQs, cookouts, and picnics, dining alfresco can leave Angelinos feeling bored of the same menu. How do we bust out of the routine to get our tardeada-mojo back? Spicing up the menu is the #1 priority in our casa, and that starts with Cacique Soy Chorizo. Turn on your grills and welcome to flavor-town! Cacique Soy Chorizo is packed with a special blend of spices and herbs, just like the Cacique beef and pork chorizos. I bet you won’t even tell the difference! We’ve combined this new Cacique Soy Chorizo with ground turkey. Let’s face it, lean turkey can often lead to dry burgers, but Cacique Soy Chorizo brings all that bold spice and moisture for a simple, yet extremely flavorful burger. 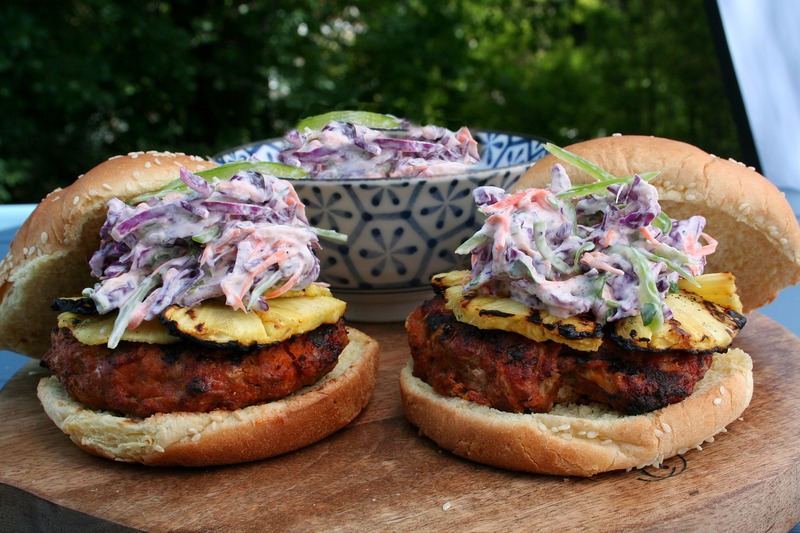 We’ve also topped the burger with a creamy red cabbage slaw that is refreshing from the heat of the turkey burger. 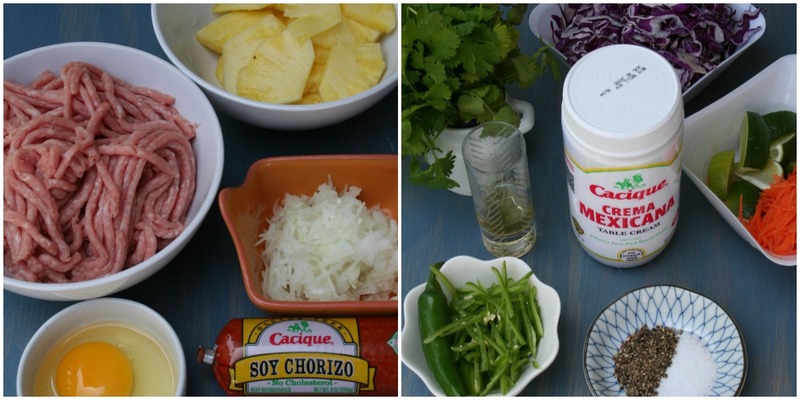 The slaw is made with another one of our Cacique favorites, Crema Mexicana. The buttery crema is a natural sidekick for tacos, tostadas, gorditas, sopes, and now the fresh taste of milky cream is paired with a great American staple: the hamburger. Drizzle your crema? The recipe for our creamy slaw with Cacique Crema Mexicana doesn’t drizzle – it sparkles, shimmers and soars beyond boring cookout condiments. A bit of grilled pineapple is all you need to really stun your friends and family’s taste buds. Follow this link or visit Caciqueinc.com for get the complete recipe. If you’re still hingry for more you can follow cacique on Facebook, Twitter and Instagram. 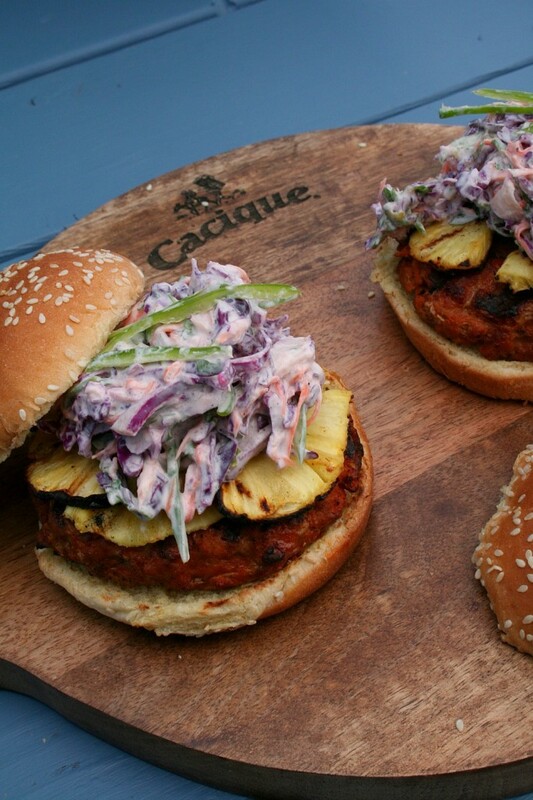 Cacique Soy Chorizo Burgers with Cream Slaw | Pin It for later!